Our readers originally from the Southern United States – known lovingly as “the South” – know that there are some items found atop a dining room table that are considered quintessential when it comes to entertaining. Quite frankly, any respectable Southern host or hostess couldn’t bare the thought of inviting guests over without these arguably necessary reception pieces. Yet, what you you might not realize was also considered a very Southern adornment to the table was…you guessed it, a pineapple! 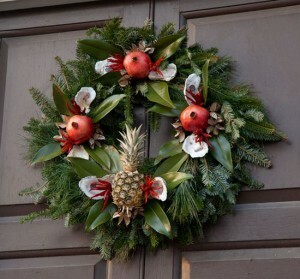 Plenty more pineapples than flowers greeted guests to a family’s home during the 1600s and 1700s. In fact, during America’s colonial days, a hostess’s ability to have a pineapple for an important dining event said as much about her rank as it did about her resourcefulness. The pineapple served as the ultimate table display and was a conversation starter. Even more interesting, the glowing, golden centerpiece was…rented. That’s right! As this post form Apartment Therapy explains, there is quite a story in the history of the hospitable pineapple. Yes ma’am. People sure did go to great lengths to be charming and most importantly mind their manners. 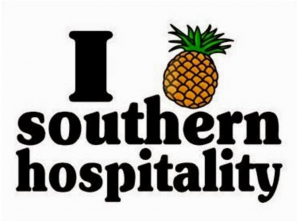 Now, if that’s not southern hospitality, we don’t know what is. Christmas in 1840: What Tree? We stumbled across an interesting story today that we thought would be a neat post to share with our regular readers. Remember when ole’ Dr. Lloyd here told you about the history of the pineapple, or how pineapples were once a status symbol among Europeans? Well, down in South Carolina, the Historic Columbia Foundation will be sharing similar anecdotes during candlelight tours of the capitol’s historic buildings later this month. The tours will showcase exactly what Christmas in the late 19th century was like for the buildings’ residents. Surprisingly, Christmas trees weren’t common as decoration until after the 1850s. But you know what was? You guessed it – pineapples! This article by TheState.com gives great insight into what a Christmas celebration would have looked like during the American historical era – and give some reasons as to why the pineapple crazes seems to endure. In addition to recipes and prep tips, we at Chestnut Hill Farms like to educate our readers about every aspect of the fruit they purchase from us. It’s part of our company culture. We want our customers to be as passionate about the products we sell as we are! We’re even crazy enough to give those visitors to Lloyd’s Corner a science tutorial on El Niño. (We know…it was a tough one). Much like our previous post on pineapples, the history of the plantain is fascinating. It’s had its very own world tour. Yet, in this instance, the origins of the plantain can be found on the other side of the globe. Since then, the plantain has become a staple product in many countries across several continents. From Asia to Africa, to many parts of Latin America, and even among communities in the United States, the plantain is widely eaten year-round.